HomeBusinessWhich Party Creates More Jobs? During an election-year clash over which U.S. political party has the best prescription for curing unemployment, Democrats can argue that almost two-thirds of private-sector job growth in the past five decades came with them in the White House. The debate over jobs intensified last week, when the Labor Department reported that U.S. employers added a total of 115,000 private and government jobs in April, fewer than forecast and the smallest number in six months. Private payrolls grew by 130,000 and, for the first time under President Barack Obama, surpassed the total in January 2009, when he took office. Total employment stayed below January 2009 because there are 607,000 fewer federal, state and local government employees, the Labor Department reported May 4. April’s unemployment rate fell one percentage point to 8.1 percent as more workers left the labor force. Republican presidential candidate Mitt Romney, campaigning on his business experience and the promise of low taxes and lighter government regulation, said the “terrible and very disappointing” jobs report was evidence that Obama’s economic policies aren’t working. “This is way, way, way off from what should happen in a normal recovery,” Romney said in a Fox News Channel interview. Obama focused his remarks on the improvement at non- government employers. “Our businesses have now created more than 4.2 million new jobs over the last 26 months — more than 1 million jobs in the last six months alone,” Obama said at a May 4 event in Virginia. 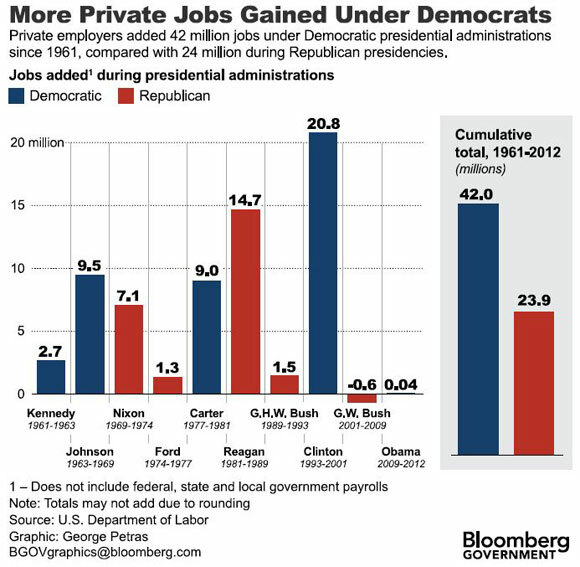 Clinton’s eight-year tenure accounted for half of the Democrats’ total private employment gains over the past five decades. More than 60 percent of the Republicans’ increase came during Reagan’s two terms in office. Republicans, campaigning on pledges to cut government spending and programs, had a relatively better record at creating public-sector jobs. Since January 1961, federal, state and local government employment grew by 7.1 million under Republican presidents and 6.3 million when Democrats were in the White House. Government agencies added an average of 21,000 jobs per month under Republicans, compared with 22,000 for Democrats. Who Demands Imports More – Rich or Poor?